Naturally low in fat, high in fibre and rich in protein. 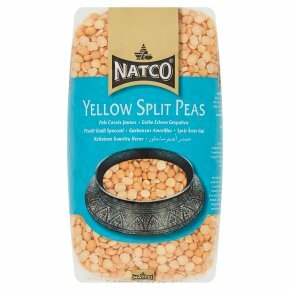 Suitable for vegetarians.Yellow split peas Perfect for soups, with a mild and creamy taste. Yellow Pea Dal Serves 2 Ingredients 225g Natco yellow split peas; 3 tbsp Natco butter ghee; 1 tsp Natco cumin seeds; 1 small onion, chopped; 2 tomatoes, chopped; 1 tsp salt; 700ml water; 2 garlic cloves, crushed; 1/4 tsp Natco turmeric powder; 1/2 tsp Natco chilli powder. Method Heat the ghee in a saucepan, add the cumin seeds and fry for 1 min.Add the onion and fry until lightly browned. Stir in the garlic, turmeric, chilli, tomato and salt and cook for 2 mins. Add the water and split peas, bring to the boil, cover and simmer for 20 mins, until the split peas are tender. Garnish with fresh coriander and serve with Natco Basmati rice. Rinse and drain 300g of split peas (no need to soak). Add to 1 ltr of fresh water, bring to the boil and simmer for 15-20 mins until tender.Caution: Do not eat raw.